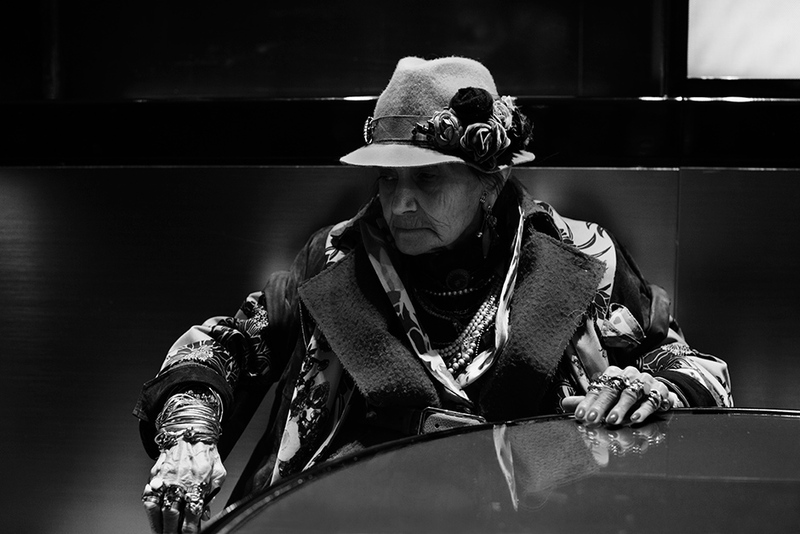 I stopped in my tracks when I saw this woman sitting at the Armani Caffe having her morning cappuccino. Have you ever seen the famous Brassai photo “Miss Diamonds?” This wonderful woman immediately brought that image to mind, so I delayed the meeting I was at the caffe to attend, and took my time to shoot her in all her glory. If you know the Armani Caffe in Milano then you know the Armani Libre is right next door, so after shooting I ran over and bought a copy of my book and made a little present of it to her. She seemed to enjoy it very much. I’ve since learned she is a regular at the caffe and hopefully she will make a few more appearances on this blog soon. Wonderful! I hope you spot her more often – she is a lady with serious style! I love the way you love us Italians ! Fashion fades. 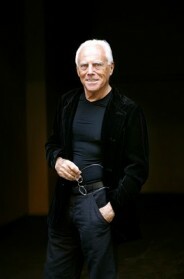 Italian style is eternal! I’ve seen her too in Milan, So strong and elegant! Now that’s how you stack rings! Amazing photo! I love that you gave her a copy of your book too, so great! I hope this shot makes it into one of your books. What a lovely experience! I guess that, because of the nature of your job, you will live moments like that a lot. How beautiful! I wish you could tell us more about what’s behind your pictures, that kind of moments. Looking forward to more pictures like this! The lady is stunning, as is the black-and-white photo. Style has no age. Wow, complimenti! This one is a classic already! The lighting is hauntingly beautiful in this shot. She’s beautiful! Wow. Just WOW. Please tell us this lady will be in the new book. Ahhh, i love her and your story. a riveting new favourite. sometimes fashion points past itself to a rich story. Thank you, Scott! This exceeds your regular “sart” image….genius! Of course I know the Armnai Libre store, what fashion savvy geezer doesn’t? I can only imagine she is still poring over your book and learning from the wealth of your experience…and that she is hoping to be in the next weighty tome! Can’t wait to see it hit the best bookstores in the world. Move over Sander, move over Testino! Black and white is perfect – but I would love to see it in colour also. Is that possible? 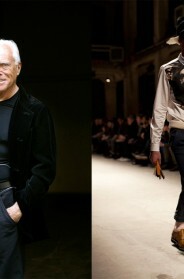 This is the essence of fashion and style…distilled thru your lens. So glad you gave her your book. Your humility continues to be the cornerstone of your art. Keep on connecting with the people, and your art will transcend the ages. Bravo! She gave a little present …to your eyes (lenses). She is spectacular! I aspire to be her when I’m her age! The style and look are as affinity pair, you can imagine from one to the other, fashion is a mirror of costume and aesthetic expression of creativity and life. What a beautiful photo of a characteristic woman. Love the little story behind it too! The black and white picture is more dramatic and gives a timeless touch to the subject. Beautiful! Awesome portrait. Black and white is so strong. I am speechless. I had to write to you to tell you I was speechless. WOW! 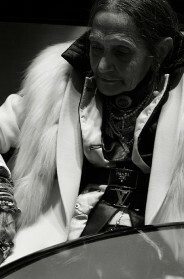 Style knows no age! Stunning lady–looking forward to seeing more of her. Lovely black-and-white photo, too. What I love about Brassai’s ‘Miss Diamonds’ is the subject’s proud gaze into the lens. I wonder if in other photographs you made of this wonderful lady she lifted her face out of the shadows? I love that you gave her the book. I’ll bet she’s enjoying it immensely. It so reminded me of the Brassai picture the second i saw it! It’ s a big one..
Sicuramente si ama e ama la vita! Vuole dirci che non solo esiste , ma che continua a seguire il gioco e partecipa! I love the reflection on the table of all the rings on her hand. Classic Sartorialist, that one. Bravo. I love how you captured her in a slight motion and without her directly looking into the camera. It is as if we can “see” her better and create who we think her to be. I must note it is inspiring to see her wearing multiple rings on every finger, numerous bracelets and necklaces. Why is it mostly the elderly who practice this? It seems the elderly live in the day in which they stand and the young live looking at the morrow – which is not promised. I agree with the elderly …wear it all today whilst you have the chance! So much detail, would luv to see this posted in all it’s glorious color. I have a similar story for a frequent at Hudson Bay in Vancouver. I use to always see this lovely elderly women always dressed immaculately, same section of the department store, always in some bold colour and fiery red hair. I have often wanted to stop and talk to her or even ask for a photo but never have. I didnt see her for years until just a few weeks ago, which totally made my day! She didn’t disappoint! I always see her at Bianco Latte in Milan as well on Sat morning. I prefer her with vivid colours. Amazing how you can spot fashionistas in all forms ,shapes, ages and genders. Kudos Scott you are the best! Such splendid eccentricity! So many women loose any fashion sense in middle age because they don’t have the legs or whatever, and by the time they are older they have forgotten how to dress creatively. But I think that’s the time you should really start to indulge. Nothing is going to make you young again, but you can look dowdy or fabulous. This is fabulous! Not very younger women could have this look.